When a mate suggested we go out and try BrewDog’s Sink the Bismarck, a beer that boasts 41% alcohol by volume (ABV), I thought it must have been a typo. Surely he meant 4.1%? And then when the waitress at Auckland bar Brew on Quay said one 30ml serve of this infamous quadruple IPA would set me back $20NZD, I thought she was having a laugh. Surly she meant $2? 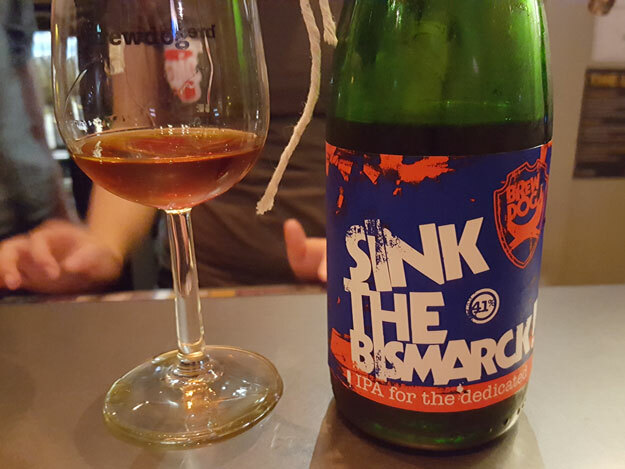 Well, it turns out there was no typo, that I was the one having a laugh; BrewDog’s Sink the Bismarck is a very real thing indeed, and it truly is one of the strongest beers in the world (though it’s still not as strong as Snake Venom). So I forked over the cash for a shot of the sweet stuff, and this is what I thought of it. Blurb about the beer (from the BrewDog website): Sink the Bismarck is a quadruple IPA that contains four times the hops, four times the bitterness, and has been frozen four times to create a staggering 41% ABV. This is an IPA amplified, the most evocative style of the craft beer resistance with the volume cranked off the scale. Kettle hopped, dry hopped then freeze hopped for a deep fruit, resinous and spicy aroma. A full out attack on your taste-buds ensues as the incredibly smooth liquid delivers a crescendo of malt, sweet honey, hop oils and a torpedo of hop bitterness which lasts and lasts. Tastes like: Someone accidentally poured me a shot of Jäger or Sambuca; not beer. And just like drinking a strong spirit straight, Sink the Bismarck dries all the spit in my mouth and even stings a little bit as I let a small sip of it loose on my unsuspecting taste buds. It’s thick and syrupy, highly viscous, and smells almost exactly as it tastes: of sickly sweet booze, brown sugar, and liquorish. I can detect no carbonation in it whatsoever, but there is only a tiny amount of amber-hued beer in my glass, so it’s difficult to say for certain. Still, as strong as this beer undoubtedly is, it does go down remarkably smooth and silky. There’s a pleasant burn in the back of my throat, but, speaking as a some-time whisky drinker, this high-alcohol beer isn’t quite as fiery as I was expecting. The verdict: So is BrewDog’s Sink the Bismarck a good beer? It’s difficult to say without any reference point to draw upon; I’ve certainly never had a beer like this one before. Do I like it at least? Yes and no. As a gimmick beer, I’m not sure Sink the Bismarck was brewed to be enjoyed but experienced, and I’m glad I got to do that. But I won’t be buying another shot of the stuff at $20 a pop. Mrs Best Beer HQ would kill me. Movie/beer pairing: The same mate who suggested we try BrewDog’s Sink the Bismarck in the first place also suggested that I should pair the beer with 2001: A Space Odyssey in my online beer review. While the 1968 masterpiece is suitably epic and bonkers enough to pair well with BrewDog’s Sink the Bismarck, I’d listened to more than enough of his suggestions for one night. So the more I thought about it, the more I kept coming back to my favourite Stanley Kubrick film of all time, the amazing Cold War black comedy Dr. Strangelove or: How I Learned to Stop Worrying and Love the Bomb. You see, like this movie, BrewDog’s Sink the Bismarck is anarchic, utterly ridiculous, and even a little bit apocalyptic. I certainly felt like I was “riding the bomb” when drinking it.